Hannah's Ethics Blog ! : And so the Ethical Journey Begins! And so the Ethical Journey Begins! I. Since this is the beginning of my Ethic's Blog, I unfortunately do not have a question from last week to answer nor summarize. II. Last week was my first full week in Ethic's Class, and I have been loving it so far. Last year I would always ask people what they learned in that class, and they would simply reply : "Ethical Stuff." Of course this gave me no real sense of what went on, but after this week, I feel like I am starting to get the concept of it. I have really enjoyed having this class as my 1st Period, and I hope that the year continues to be this great! This week we discussed Loaded Language, Fallacies, Power Words, and their use in society. I knew briefly about some of these things before we really studied them, but I never really knew how much use they have in modern day society! After searching for them in current news articles and ads, I realized how easy it was to be persuaded or fooled by them. I truly wonder how many times I have fallen for some of these writing techniques! In class we also watched two related episodes of The Awful Truth with Michael Moore. This is a controversial show that stars Michael Moore, an average "Joe Six-Pack", as he goes around the United States showing Americans "what the government is really like". After watching the first couple of minutes of an episode, you can tell that he is a very strong Democrat. He uses suspicious editing, ambush interviews, and several fallacies and loaded language to make the government look bad, especially Republicans. This series is an excellent example of how loaded language is used in our society. In one of the episodes, Moore tried to get Republican Presidential Candidates to jump into his mobile mosh pit. He always caught the candidates off guard, so their answers never came out quite the way they would have wanted them to. He also used editing to make their responses look even more bad. One candidate actually agreed to do it, but it totally backfired on him in his campaign. 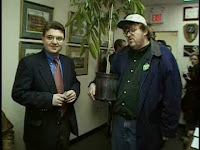 In another episode, Michael Moore tried to have a Ficus plant run in a Congressional Election. In the episode, he tired to find all of the loop-holes in hour government to justify this plant running for office against an "unopposed candidate". One major fact that Mr. Moore skimmed over was the fact that it was just a Primary Election for the Republican candidate to run in the November Election! Mr. Moore made a big stink over anything that didn't go his way, and he edited the film to make these things seem more drastic. This episode brought up a ton of debate in class that day! I sort of understand his point, but I don't think that I would go to the extreme that he did. I agree that a little healthy competition is good for an election, but running against a Ficus is just insane! If it really won, how would it preform it's Congressional Duties? Also I wonder how many people actually knew that it was a plant running for office, and not a person. On campaign posters, they only put the last name of the candidate. If someone saw the name Ficus on a sign, they may assume that is is Mr. ______ Ficus. (ex: Mr. John Ficus) He could really be misleading hundreds of people! In class this week, after watching the Awful Truth episodes, we learned that at least four "Ficus Candidates" ran in the state of Virginia. Since this occurred during the 2000 election, I do not remember anything about it coming up in the news. I wonder how the "Ficus Campaigns" went in Virginia and what controversy the caused? Also, I wonder if any of them actually won?